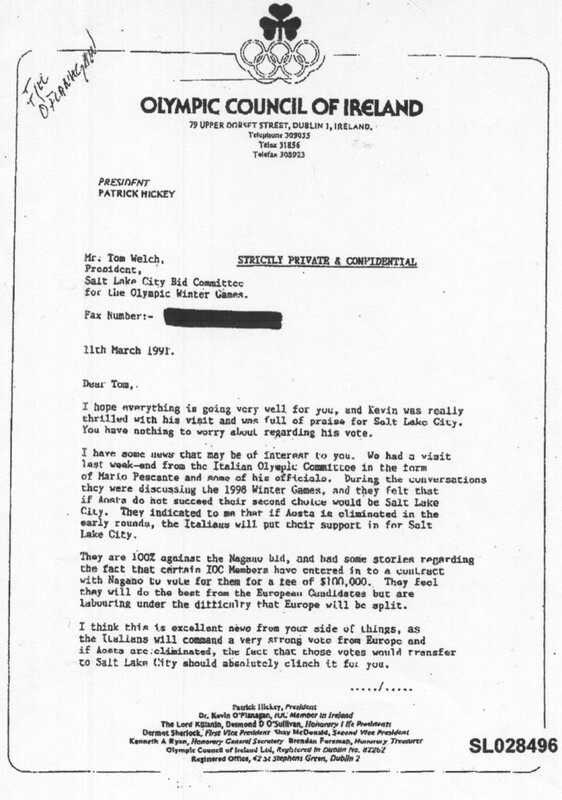 Transparency In Sport has recently unearthed in an Olympic archive a „Strictly private and confidential“ letter written by Hickey in 1991 to the good ol’ boys in Salt Lake City who were bidding for the 1998 winter games. The helpful Hickey had some inside track on pay-offs. „Certain IOC members have entered in to a contract with Nagano to vote for them for a fee of $100,000“, he confided. Nagano won the games and lesson learned, Salt Lake paid industrial-scale bribes and won 2002. Hickey said he had this information from Italy’s Mario Pescante who survived a doping cover-up scandal in Italian football to become Berlusconi’s sports minister and an IOC member. As the scandal of Salt Lake’s bribes unfolded in 1999 Pat Hickey was an obvious candidate for the IOC’s reform committee. He sat alongside fellow IOC members Mario Pescante; Ivan Slavkov (forced to resign after Panorama filmed him soliciting a bribe), Joao Havelange (forced to resign last year after Panorama caught him trousering a $1 million kickback), Pal Schmitt (resigned as president of Hungary earlier this year following allegations that he plagiarised his PhD thesis); Primo Nebiolo (now deceased; rigged athletics results and supplied drugs to Italian athletes), and ice hockey boss Rene Fasel (reprimanded by the IOC Ethics Commission in 2010 for „tarnishing“ their reputation. A close friend had been paid £800,000 by the Swiss company awarded international marketing rights for ice hockey). That Swiss company, which also receives football World Cup marketing contracts, is now headed by Philipp Blatter nephew of seedy FIFA president Sepp Blatter, also a member of the reform commission. Making up the numbers were Henry Kissinger and, er, Seb Coe. Coincidentally, on the same day last month the Lukashenko ban was announced Hickey was elected unopposed to the IOC’s Executive Board. Pat Hickey ist ein wichtiger Wahlhelfer des UDIOCM für 2013. Interessantes von Andrew Jennings über Hickey’s Kontakte zur weissrussischen Diktatur. Hab an dieser Stelle noch keine englischsprachigen Crossposts gesehen. Ist das die Premiere hier? Nö. AJ und ich sind unzertrennlich. Klick seinen Autorennamen an, dann siehst Du mehr – und noch mehr Texte erscheinen, wenn ich im Maschinenraum alle Beiträge den jeweiligen Autoren zugeordnet habe. Ah okay. Die uninformierte Nachfrage war auch eher dem Umstand geschuldet, dass ich dein Blog seit der Pechstein-Debatte recht lange nicht verfolgt habe. Gefällt mir extrem gut, dass du englischsprachige Beiträge einstreust und die Reichweite erhöhst. Einer der Sportfreunde aus der SLC-Ethik-Kommission des IOC, der, der seine WM 2014 an Lukaschenko vergeben hat, ist übrigens gestern wieder zum Verbandspräsidenten „gewählt“ worden, mit noch bessrem Ergebnis als es die Parlamentswahlen für Kumpel Lukashenko gebracht haben und natürlich – ohne Gegenkandidaten: Rene Fasel, IIHF. Could IIHF-president Rene Fasel become IOC leader?